Grey loved it. It’s hard to figure out how much he’s actually GETTING from the books, but he begged to read it. He ate it up. 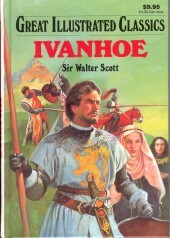 Then, when we’d finished reading it together, we got the old Ivanhoe movie and watched it together. (This has been mostly a Daddy and Grey thing.) And again, he loved it. He talked about Ivanhoe and King Richard and Robin Hood. So we got another one: Treasure Island. There was the treasure map, the Black Spot, Ben Gun, a skeleton used to line up the compass, buried gold, and of course Long John Silver with that parrot on his squinty-peg-legged-salty-taking self. In Treasure Island, boys are treated like men, in the way men wish they were treated. Between them Ivanhoe and Treasure Island ARE the archtypes of Knights and Castles, and Pirates. They are the stories from whence all the inaccurate hoopla flows. What a delight! What a touchstone of boyhood to encounter these books and begin daydreaming in the way that boys have daydreamed for 150 years now of days that never were — but the world would’ve been a more interesting place if they had been. Last night, Adam and Grey watched the old Disney version of Treasure Island. Do you see a trend? Illustrated Classics = Have an Old Disney Version appropriate for young people. I don’t know about Grey, but Adam and I are hooked. Next up: 20,000 Leagues Under the Sea. Or maybe the Three Musketeers (since we already HAVE that old movie). Then I remembered that my son is 4. Somehow, he’ll survive the abridged version. In fact, no way he has the patience for the unabridged version. So let’s give him good stuff to daydream about. Let’s teach him to love literature. Let’s show him that the old that is strong does not wither, and that a story can be good and still not have action figures available for purchase at Toys R Us. And best of all, let’s get to reading some good stuff at night, so I never have to read another L’il Critter story to THAT child, at least! I’d like to start out by saying that I am clear that I’m the weird one here. Everyone else SEEMS to be in line, and I’m the one who just doesn’t fit in. That said, I simply DO NOT UNDERSTAND why people like depressing media. For example, through a miracle of babysitting, my husband and I got to go see “Where the Wild Things Are” on Friday night. (I would post a spoiler warning, but sheesh. If you haven’t read the book, which spoils the plot, then go get it right now!) The movie is sad and depressing, and does not cease to be sad and depressing. You have a lonely kid, an all-too-human and overstretched mom, a teenage sister in a loving but rather grim world. Then you get taken to a fantasy world where …. things are just as bad. In fact, bad enough to make the real world where people break your igloos and your sister ignores your pain and your mom is dating some guy seem much better than your fantasy world. So we conclude feeling just as crappy as we started. Actually crappier — I was in a good mood going in. But hey, it was visually lovely. It’s a box office hit. I get it: other people really like reading books and watching movies that make them feel horrid. I know I’m the weird one because I don’t. I just fail to fathom what about it feels good and makes you want more? See, I understand WHY it is important to tell and hear stories about real things that are awful. I will sit down and read about the holocaust to understand how humans can be so brutal to each other and work to prevent it. I understand why it’s important that we know and see that humanity is capable of great evil. I listen to the news, even when I’d rather never heard again how some person strapped in a bomb-vest blew themselves up in a crowded marketplace full of sons and mothers and beloved uncles. But I turn on the news anyway and look at the world as it is, to the best of my abilities. I do it with the same amount of joy and enjoyment that I have for dental hygiene, without the sparkly teeth afterwards. I do it because it is important and necessary and part of being a good citizen. I do not enjoy a minute of it. So why on earth would I choose to watch movies that inspire the same sense of impossible despair? Why would I want to read books where people are horrible to each other and hurt each other and terrible things happen and at the end of the book, it’s still horrible and no one has learned and the sun will die someday? Why do people spend so much time imagining ways that we could be awful to each other that don’t really exist? What about this is satisfying? I read those books, and am usually glad I have, but I never desire to read them again. It makes it very difficult for me to find media that suits. It’s hard to explain to friends. I often sum it up by saying that I don’t like violence. (I nearly vomited at the Serenity movie — I actually left shaking and crying.) But that’s not actually it. I’ll get through violence (as long as the folks writing it/showing it don’t seem to enjoy it too much) to get to redemption, learning and hope. I found Firefly generally fantastic. The body count in the Lord of the Rings is high, but so is the hope-count. One of my favorite books of the last decade, “The Curse of Chalion” by Bujold starts with a beaten, broken man who has experienced utter betrayal. But it ends up with redemption, healing, hope, love and victory. There are very bad things in it, but the people who ENJOY doing horrible things to other people are a minority, and they get theirs in the end. I guess I feel that the world is sufficiently grim without imagining more worse things in it than actually exist. I choose to spend my imaginative time on seeing the world as, perhaps, a better place than it is, and humanity as generally loving and redeemable. If you love those kind of movies or books I’m talking about — the dark depressing ones where it all seems futile — can you please explain to me why? What it does for you that makes you want to come back? For Josh, Em an Al — my three better halves, and never mind the math. I beat Em in Gheos last night. I know all three of the acknowledgees. I even know the authoress. This is SO COOL. It’s like, um, really cool. At least half my friends have had visions of writing a book and having it published, myself included. More of my friends have actually written books, myself not included. But that someone I know can have, through hard work and talent, actually written and published a real book which can really be purchased through Amazon!??! Tres cool. So go. Buy this book. Read this book. (I will as soon as I can — only my great devotion to my children prevents me from perching on the couch right now.) This book represents the hopes that we have, but fulfilled by great efforts and abilities of Maggie.